Niobrara River Regional Sediment Management Plan (NE) | WEST Consultants, Inc.
WEST was tasked by the US Army Corps of Engineers, Omaha District, to perform a Phase II Regional Sediment Management (RSM) plan for the Niobrara River, which joins the Missouri River in northeast Nebraska just upstream of the headwaters of Lewis and Clark Lake. The Niobrara River supplies 55% to 60% of the sediment that enters Lewis and Clark Lake. 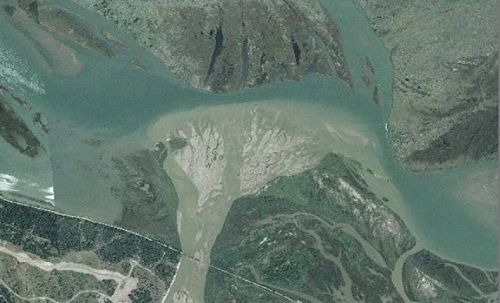 The delta formed at the confluence is causing increased surface water flooding, increased groundwater levels, water quality and water supply problems for municipal water intakes and recreation access. Based on these sediment concerns in the Niobrara River Basin, the purpose of this study is to provide a basin wide sediment yield analysis of the Niobrara River Basin to (1) identify the various sources of sediment; (2) determine if the contributions from the various sources are changing over time, and if so are these changes due to natural events or human induced factors; and (3) determine the impacts of basin wide sediment management practices on the main stem of the Niobrara River and the total sediment yield from the basin. Information developed by this study was used to determine the feasibility of managing sediment from the Niobrara River Basin by employing the USACE-developed RSM methodology. This methodology is designed to solve sediment related problems at the regional scale in an environmentally and economically sustainable manner. This study includes the following components: (1) USGS stream gage flow and calibration data collection; (2) sediment supply and transport capacity analysis of the Niobrara River; (3) the development of a sediment budget at the Spencer Dam; (4) the development of a sediment budget at each identified gage site; (5) the development of a sediment budget for the entire Niobrara River; and (6) a sediment production estimate for the Niobrara River Basin using RUSLE. Based on this analysis, approximately 80% of sediment exported from the Niobrara River Basin was delivered from channel bank or gully erosion, and 20% was delivered from overland erosion processes. The sediment delivered from the Niobrara River Basin appeared to be reducing over time; however, a significant amount of sediment would continue to be delivered to Lewis and Clark Lake. Based on management strategies in similar physiographic regions, basin wide sediment management would be effective for sediment remediation, but the sediment loading from the Niobrara River could not be completely eliminated.